It's difficult to study a parasite with a complex life-cycle, one that alternates between free-living creature and cell-enclosed parasite. 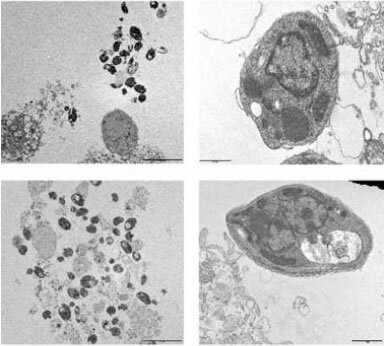 Separating a parasite from its host cell is extremely difficult. However, researchers have devised a strategy in which special fluorescent Leishmania mexicana parasites have been developed for study. When infected cells are passed through a machine to separate cell components based on how much they glow, researchers were able to gather Leishmania parasites with only 2% contamination, making study easier. SF authors have been thinking about how light might be used to decontaminate crew members exposed to exotic organisms. 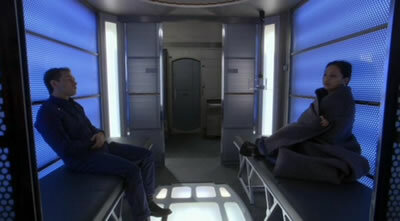 In Star Trek Enterprise, decontamination chambers used light and topical skin gels. Thankfully, this method became obsolete as transporter biofilters came into wide use in the 23rd and 24th centuries. What a relief! Author Robert J. Sawyer uses a tuned-laser decontamination process in his 2003 novel Hybrids (Neanderthal Parallax). Readers may not be aware that pulse laser systems have been used to attack unwanted cells, cells that have not been specially developed for researcher. See Forced Resonance Ultra-Short Pulse Laser Kills Viruses Dead and Raydiance USP Laser Attacks Unwanted Cells for more information. From Eurekalert; thanks to Moira for writing in with this one.